The Scan Man has run into several clients recently who complained that they were not getting any search results when looking for text contained within searchable PDF’s. The common thread was that they were all using Windows 7 64-bit Search. Windows 7′s search capabilities are pretty good, but for some reason the 64-bit has a problem indexing PDF files. 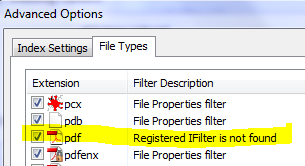 Windows Search uses something called an iFilter to help it index files, and the PDF iFilter for 64-bit Windows is missing. (This probably applies to 64-bit Vista and 64-bit XP too). If you see that message, you have the iFilter problem. Visit the DocumentSnap website for the complete instructions for installing the Adobe IFilter. The process takes about 4 minutes and is very easy.